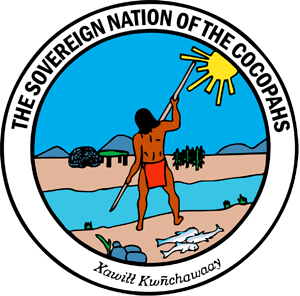 COCOPAH INDIAN TRIBE A Tradition of Honor. A Future of Progress. 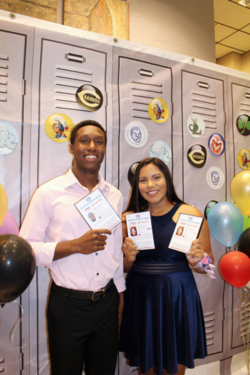 Cocopah tribal members and high school seniors Yohan Stokes and Chloe Garcia were recognized at the 2017-2018 Yuma Sun/Rotary Club of Yuma All Region Teams Sports Banquet. 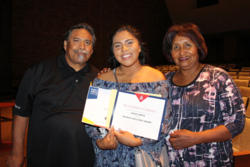 Arizona State University Scholastic Scholarship, Arizona Western College Athletic Scholarship/Softball, Northern Arizona University Lumberjack Scholars Award, and University of Arizona Wildcat Excellence Award. 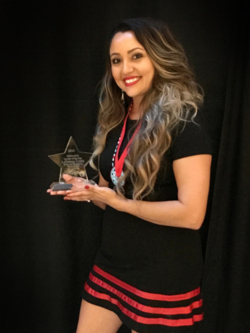 Cocopah Tribal Member LaDonna Crabb has been named Intermediate Teacher of the Year for Yuma County. Ms. Crabb is a 4th grade teacher at Valle del Encanto Elementary School and has worked with the Somerton School District for the past 10 years. "This award just reassures that I AM making a difference! I am proud to be Cocopah and from Somerton! It’s been an amazing 10 years and I plan on only making Somerton better one day at a time, one lesson at a time, one student at a time," Crabb said. She was nominated by her principal Luciano Munoz and colleagues. 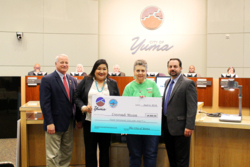 Cocopah donated a combined total of $10,000 through the City of Yuma to three local nonprofit groups. 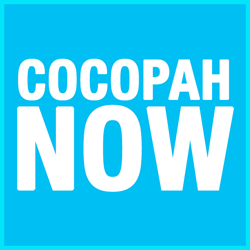 Cocopah Councilwoman Rosa J. Long (center)presents a check for $10,000 to the Yuma County Board of Supervisors. Cocopah Chairwoman Sherry Cordova, Vice Chair J. Deal Begay, Jr., Councilwoman Rosa J. Long on Thursday attended an Economic Development Regional Summit. 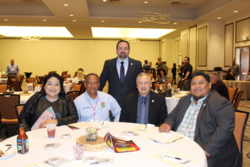 The event brought together approximately 80 public and private sector representatives from Arizona, California and Mexico to focus on education, economic development and tourism. The City of Yuma and 4FrontED partnered for this event. 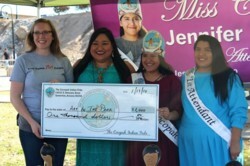 Cocopah Tribal Councilwoman Rosa J. 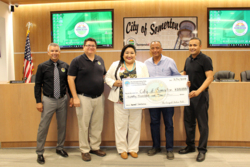 Long (center) presents a check of $20,000 to the City of Somerton. 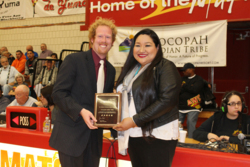 Arizona Western College Sports Information Director Sam Hovan (left) presents Cocopah Tribal Councilwoman Rosa Long (right) with an appreciation award for the Tribe's continuing sponsorship of the Matador Athletic Association. 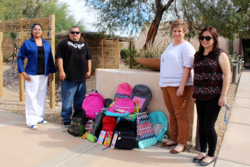 United Dreams Car Club donated backpacks and school supplies to the Cocopah Early Steps Program. Pictured left to right Nansy Heredia, public relations for the club, Rene Gonzalez, president of the club, Claudia Hutchinson, Cocopah Early Steps specialist and Christina Alonzo-Ross, Cocopah Early Steps Specialist. The car club in the past has donated to the Cocopah Head Start program.